As much as in some ways I hate the fact that Cadbury has become yet another brand to leave Britain and fall into American hands, I do love what they've been doing just recently! I picked up 3 of their newest bars of Dairy Milk at just £1 each in Tesco and I couldn't not share my thoughts on them, I love trying new beauty products but I love chocolate equally as much so I couldn't resist! 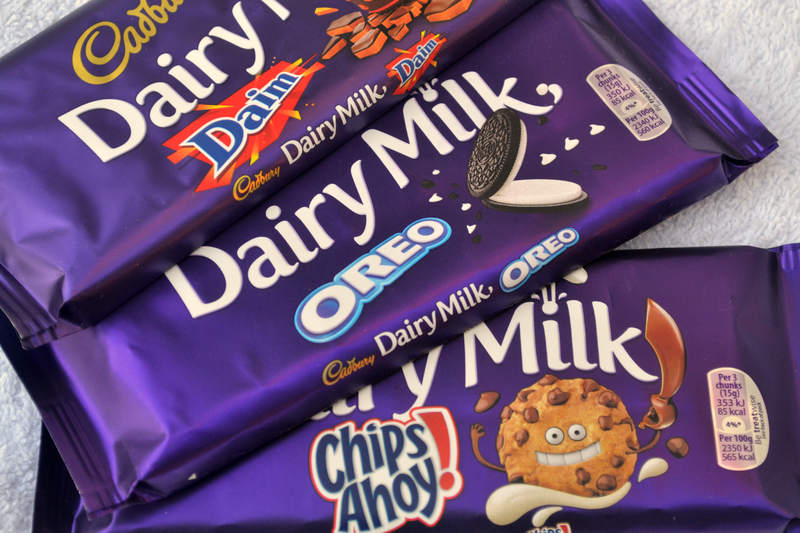 The dairy milk chocolate itself tastes just as good as it always has; smooth and creamy but these new bars have a middle of either Daim, Oreo or Chips Ahoy! I'll start with my absolutely favourite which is Chips Ahoy! For those of you who aren't familiar with American foods, Chips Ahoy are a brand of cookies so as you can imagine the middle of this bar is chocolate chip biscuit; it's soft but crunchy at the same time and the added chocolate chips makes it all the more chocolatey. Oreo is similar in the fact that there's a biscuit middle but you can also see and taste the tell-tale creamy white layer which does give you that 'Oreo' hit. Daim is a different kettle of fish, it doesn't have the layer all the way through it's actually smaller pieces of the crunchy butter almond dotted around the bar... very nice but probably my least favourite purely because I'm not a massive fan of Daim. I'm really looking forward to seeing what else Cadbury have in store for their Dairy Milk bars; I know they also do one with a strawberries and cream layer. I'm actually hoping they do something coffee related because I love the coffee chocolates you get in a box of Roses. If you're sat there thinking 'what's she doing eating chocolate, she's on Slimming World'... well you'll be pleased to know that 3 chunks of this chocolate is 4 syns so I can mix and match or in my case just snaffle all the Chips Ahoy 3 pieces at a time! What would you like to see Cadbury do next? The daim one looks so good!! Oh my I need to try them all! I know what I'm picking up on my next trip! Cadburys chocolate with Daim sounds like my idea of heaven! Oreo's I can take or leave really but the cookie one does sound quite nice. I'd quite like to see them do a bar with Nerds or Dweebs in, that would be amazing! I haven't seen the cookie one which is strange as I frequent the chocolate aisle a lot! If you are ever in Europe Milka do a bar with biscuit in called LU. It is amazing!